Not all the challenges in hotel industry are unique, but many are common in hospitality as well as in other industries. Are you frustrated and truly wish to overcome the challenges in hotel industry? Don’t fret! Despite a volatile market, year-on-year you’re witnessing a rise in travelers globally who aim to get the best hospitality services at the best price. A high tourist influx makes travel and hospitality industry very lucrative business which always have something new to offer to guests in every age. What is the need of knowing challenges in hospitality industry? To make your hotel always running and prospering, it is necessary to know and overcome the challenges in hotel industry. You need to imbibe new technologies, implement strategic decisions on the basis of data that is collected from disparate online sources and upturn your hotel business. Many property owners rent out their room or property occasionally. An OTA [Airbnb] provides them with regular guests. Having ascertained high demand in this arena, few OTAs are flourishing with vacation rentals. Vacation rentals are now the preferred for a rising number of travelers. Every other day you find new properties opening up, which is adding to the competition for hotels worldwide. You need to offer something significant to woo the guests. A consistent innovation, a technology upgrade and provide a better service to guest can only help in beating the competition. 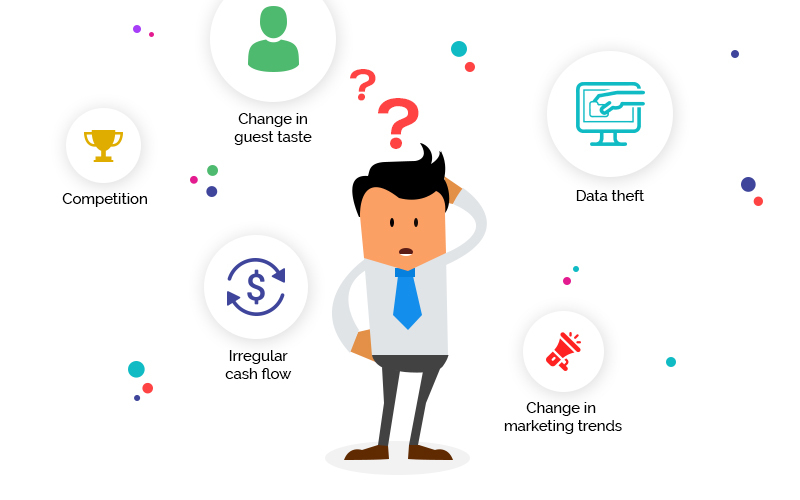 Change in guest expectations is one of the biggest challenges in hotel industry. You’ve witnessed that now-a-days guest demand a lot more from the hotel. Free WiFi, entertainment system, unique stay experience and swift check-in check-out services. Abiding by the trends is quite difficult as all the facilities aren’t available at a hotel for all type of guests. But to meet the guest expectations you can provide a self-service guest portal which will facilitate quick check-in check-out services, map location guide to your hotel, request for pick up and drop-off services. And the most important is your guest remains updated with the expenses incurred on daily basis. So, you just need to approve the valid request of your guest and be rest assured of the best hotel experience. Change in the advertising and marketing trends often create a problem for the hoteliers. The traditional marketing methods aren’t that effective now. Online marketing is a surefire method. Online deals are booked by genuine guests and major transactions are paid in advance. Engaging your guest on social media, messaging apps and other online sources can work wonders and give you results in few days. One of the major challenges in hotel industry many hotels are facing is the credit menace. Dealing with parties who pay after a period of 30, 60 and 90 days. This type of dealings are bigger ones, but at the time of cash crunch, these ‘bigwigs’ aren’t helpful. Furthermore, many payments are delayed or go in bad debts. Launching an online marketing campaign attracts direct bookings and bookings from other online channels [majorly with advance payment] that provide a quick ROI. This way you save on hiring extra personnel for payment collection, you get to pay kitchen, electricity and maintenance bills on time. In short, you have an ample cash reserve for a working capital. Every hotel requires quality staff at all the fronts whether the administration, maintenance, kitchen, housekeeping, and at frontdesk. Lack of skill in the educated youths graduating from education houses is also proving to be major challenge in hotel industry. To train the new workforce is only the remedy available. Retaining a qualified staff requires you to employ few tactics. A feeling of belongingness [culture] is to be created that allows all the members to emotionally attach with and provide them perks and higher responsibilities. Price inflation of daily use products, eatables and other amenities have risen steeply in last few years. Keeping control on stock and reducing the wastage is the primary agenda for saving on the costs incurred on a daily basis. A question of security is not a new one. Threats of digital data theft, virus attack and confidential data leaks are a big matter of concern for hoteliers globally. Understanding the scenario, you must go for a software that has enabled high-security features preventing hotel data leaks. This way you create a credibility for your hotel to bring in more guests to your hotel. Due to multiple offers coming from online sources, guests do not rely on single hotel or be a loyal customer to you. They now are in search of eye catching schemes that benefit them financially as well as in services. Reviving the loyalties is a prime concern. Using membership cards you can help retain the clients. Even if they’ve stopped using the services you can approach your guest or offer them deals or package. You can run 2 or 3 promotions at a time and compare each of them to find which is giving you the highest response. You are well aware that some hotels out there do not rely on any surefire data for taking business decisions. Due to unjustified decisions many hotels are forced to close down after a short span of doing business. For instance, business decision for dispensing budget for marketing strategies on OTAs, interiors, room rate, room type aren’t decided on the basis of actual statistical reports. In order to fight one of the prominent challenges in hotel industry you are required to use a software that‘ll give you all the business insights and help you in making informed business decisions and save on an extravagant spending on any arenas of hotel business. Using the complete data-analysis tool, you can even set the right pricing at the right time of your room to earn higher revenue. The hotel mobile app will give you insights on bookings, revenue and occupancy with a managerial report. On the basis of this report, you can easily identify which department of the hotel is driving higher revenue or which one is a loss-making endeavor. Having gone through the above points you can now have a clear idea as to which of the following challenges you face. Determining those, you can work on to tackle the challenges in hotel industry and overcome your hotel problems.